I’ve been struggling with my own depression for the past several months, and I mean really struggling. In the past month and a half, I had given up the hope of ever being a writer and put away my work-in-progress. But reading this blog, stirred something in me and one of my main characters spoke to me. I had to go write down the story she told me. It became a new chapter in the WIP, the first in a very long time. The sacred obligations of the socially conscious writer moved me and I Hope they move you, too. Ona. Good morning! I had a little bit of a snafu Sunday morning, so we’re doing things a little differently this week. Even though it’s Tuesday, here is the guest post that should have gone up then. I hope y’all will forgive me. Sometimes, despite my best intentions, I’m a bit of a wreck. Today (go ahead and pretend it’s Sunday), we have author Aya Walksfar with us. She writes both murder mysteries and literary novels, and she gives us some insight in her blog today about what drives her as a writer. Also, she’s graciously giving away two ebooks here at Women and Words. The first, Sketch of a Murder, Book 1, Special Crimes Team, is a murder mystery. 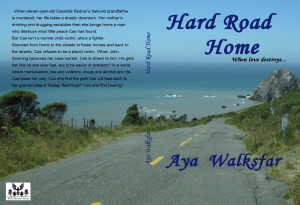 The other, Hard Road Home, is a coming-of-age work of literary fiction. To enter the drawing, leave a comment below. I’ll draw the winners on Friday, April 3.